In a few months I'm considering a new MacBook, to serve the same function. 1) My plan is to purchase a 24" monitor, and hook it up via HDMI using Apple's USB-C Digital AV Multiport Adapter. "This adapter allows you to mirror your MacBook display to your HDMI-enabled TV or display in up to 1080p at 60Hz or UHD (3840x2160) at 30Hz. It also outputs video content like movies and captured video. Simply connect the adapter to the USB-C port on your MacBook and then to your TV or projector via an HDMI cable (sold separately)." My question is, can I still set up the new MacBook to drive a second monitor with a different desktop - not just mirror the MacBook's display? And has anyone actually done this? 2) Any recommendations for a 23" or 24" monitor in the sub-$200 price range? Would like HDMI input as an option. there is a better strategy. buy TWO macs. one for going places and the other to do real work. 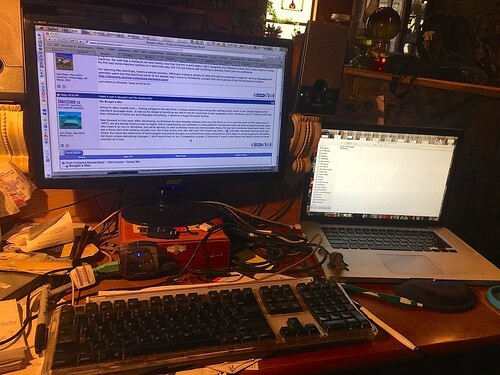 the idea of a desktop class Mac is that you will not have to put up with the nonsense of the single connector, needing to split it apart using a dock or a hub, and then have to apply benders and changers to get video to work. it's hocus pocus for no reason. the Mac Mini, while not perfect in any sense, at least has not been whacked in the connector department. there is a real ethernet connector there. audio in and out. you can expand the RAM all the way to 32G. plus change the hard drive to something bigger sometime in the future. it's not a DEAD end. USB-C may be a workable connector in the future. but right now it's just a stupidization of something that worked in the name of thinness. I toyed with the idea of a Mac Mini for my desktop. But I am somewhat enamored with the idea of a laptop being my main computer. Short road trips I just take my iPhone and iPad. But longer trips I like having my entire digital world along. Right now my MacBook Pro serves the purpose nicely. But I'm ready for newer. But I still have until around August to make up my mind. I eagerly await done initial reports on the new iMac, and to see if USB3c dongles, cables adapters, accessories and the like take off like I hope they will. And still wondering about my original question about the MacBook supporting a second monitor as a second desktop. I used to have a MacBook for my main everything Mac. but I got sick of not having enough storage and being hardware locked to the amount of RAM it could use. as it took Apple forever to get with the USB3 bandwagon on all things portable it meant that external storage was S-L-O-W. and I wasn't interested in paying the premium prices for Turdbolt cased hard drives. I found that as I used my mobile devices more I simply did not need "my world in my bag" plus I hated scary thought of losing that Mac because it got damaged or stolen. thus, I've learned that spreading around the job to where it needs to go is a better overall way to work. this is work (or home) and this is mobile is the beginning of thinking about it. if anything else, it means that the cheapest, smallest MacBook Air will live in your backpack. and for about the same price you can by the middle Mac Mini. two Macs for about 30% more than one new MacBook USBc. plus the i5 based MBA will perform much better compared the anemic CPU the MBUSBc cycles. Ed, I got your email and rather than reply to just you I figured it'd be better to chime in here for everyone to see. I'll try to answer the two questions with what I know about the USB-C and a 24-inch monitor I'm happy with. 1) Looks like according to this article by Glenn Fleishman that while the USB-C connection should support dual-monitors at this point for some reason Apple's Macbook doesn't. Its spec sheet says that the MacBook comes with “native DisplayPort 1.2 output,” which will support 4K (3840x2160 pixels in dual monitor or mirroring modes), but there’s technically no way today to access that stream of video data. 2) I recently purchase an HP Pavilion 23xi 23-Inch LCD display to go with my Mac Mini and it look great. The styling matches and it's IPS Widescreen display with a solid base. It's still plastic, but solid and not cheap and flimsy feeling like many other brands. I picked it up on Amazon for around $200 bucks. I think that's a deal breaker for me - I really like the extended desktop. Ended up with a Viewsonic 24" monitor, for $149 from Amazon and it seems to do the job. I'm in no rush, but my 2008 MacBook Pro is getting a little dated! I also posted this to the Apple help forum. A fellow just replied that he has a new MacBook just got his dongle and verified that you actually can use a second monitor as an extended desktop. He even did a screenshot! Good news, but that contradicts everything that I have been able to find so far. So, just to verify. It worked "out of the box" with Apple's HDMI adapter. No modifications or hacks? Running OS x 10.10.3? The fellow implied it just defaulted to "extended desktop" mode. He did not mention any hack required. He may be able to clarify there.